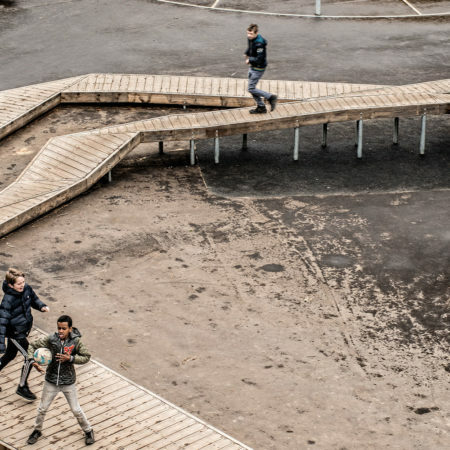 In the recent years there has been an increased focus on what happens in the schoolyard between the classes, and what play, movement and motor skills can do for learning. 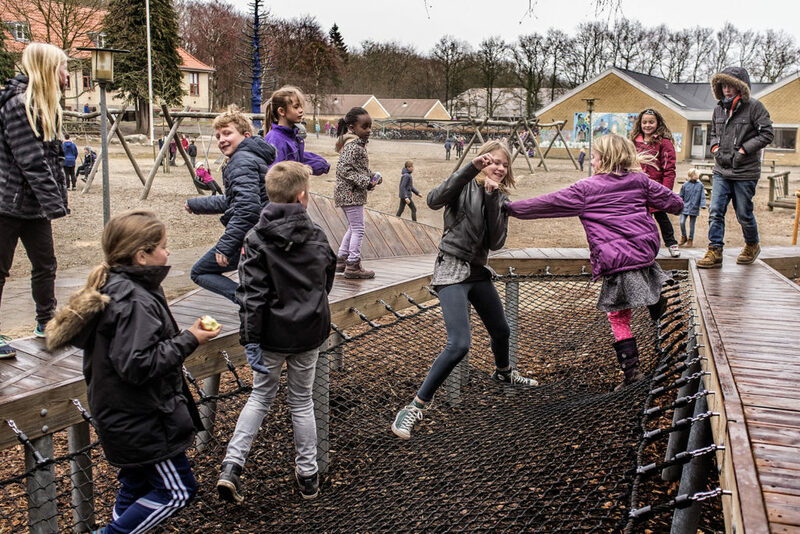 In 2013, the philanthropic fund ‘Realdania’ created a campaign, to increase physical activity among school children. 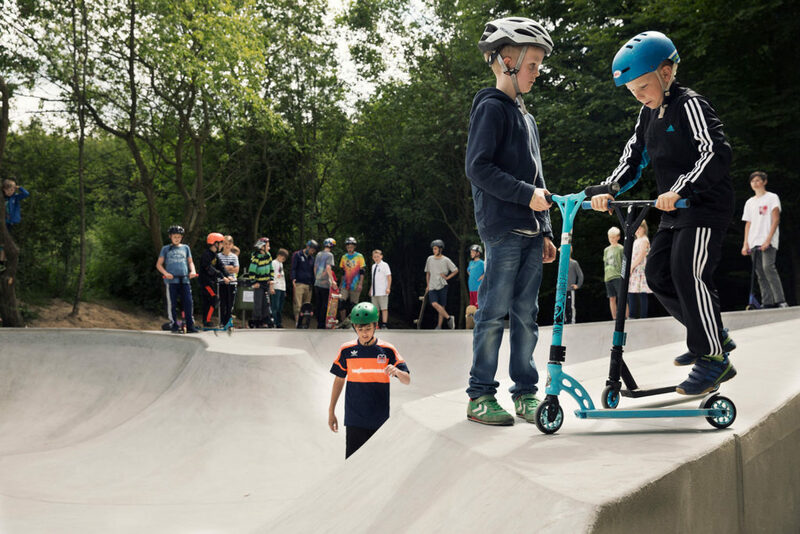 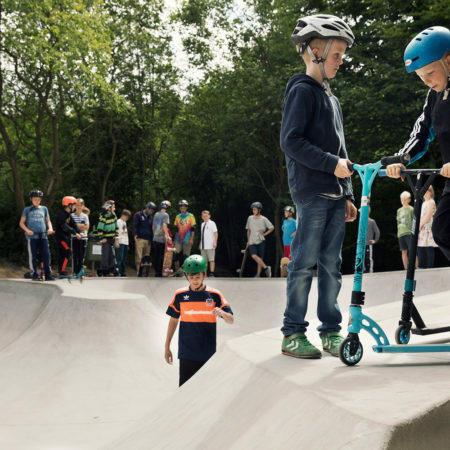 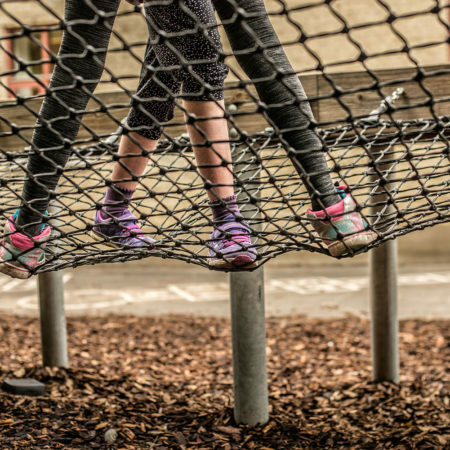 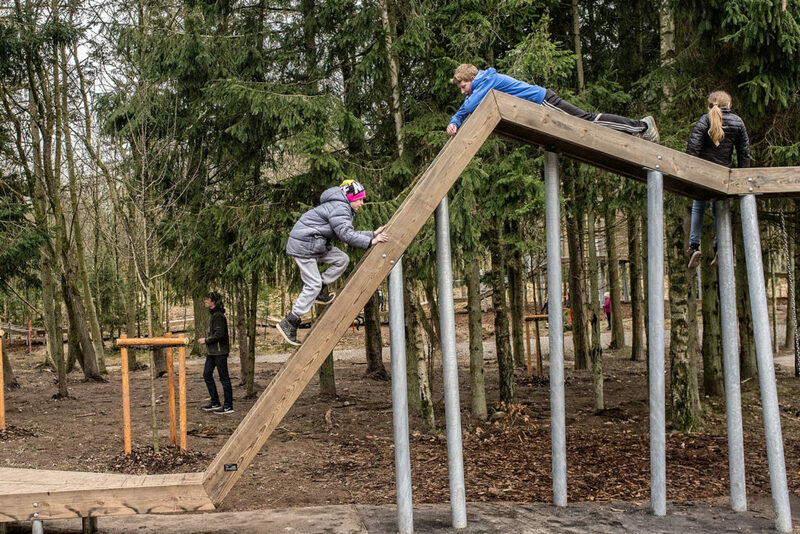 The campaign called for ‘action packed playgrounds’ that could also support ‘teaching in movement’ and outdoor learning activities. 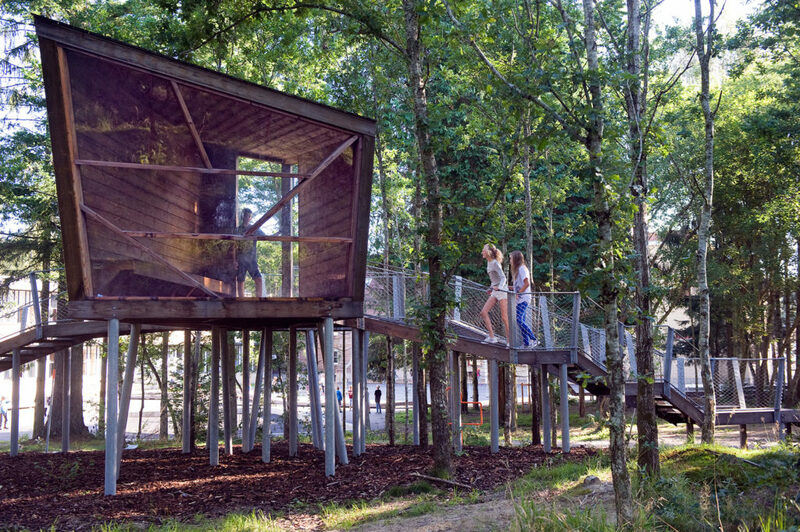 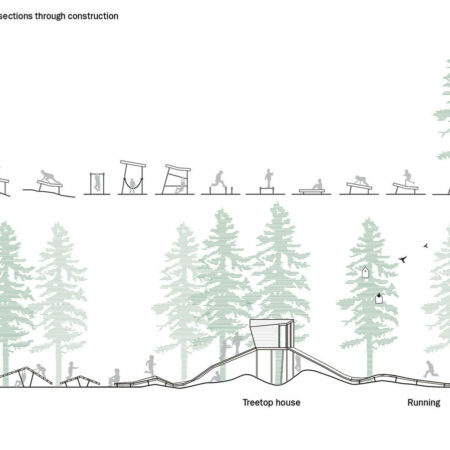 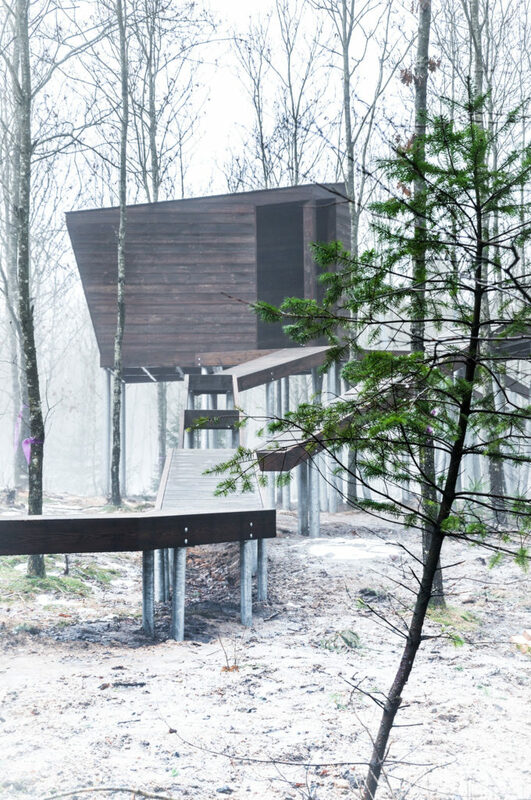 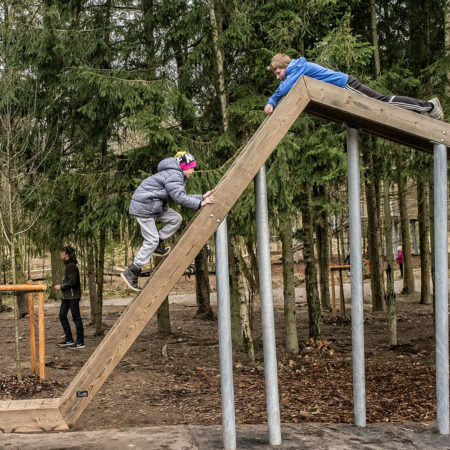 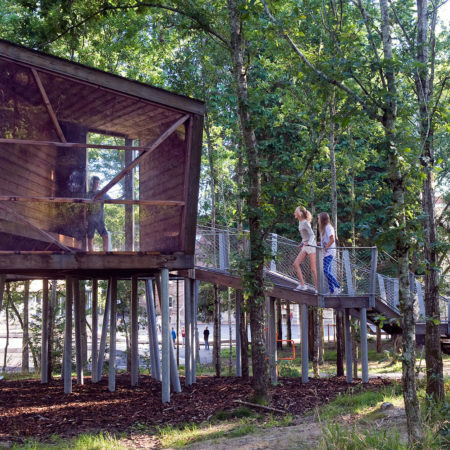 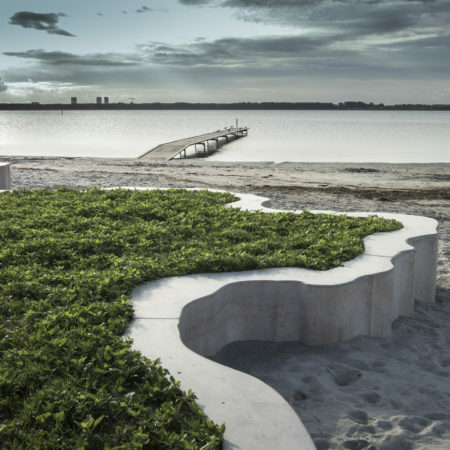 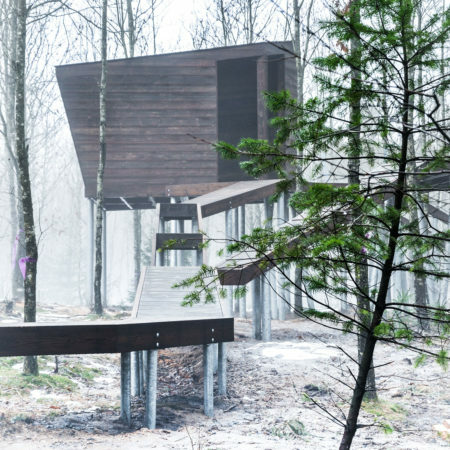 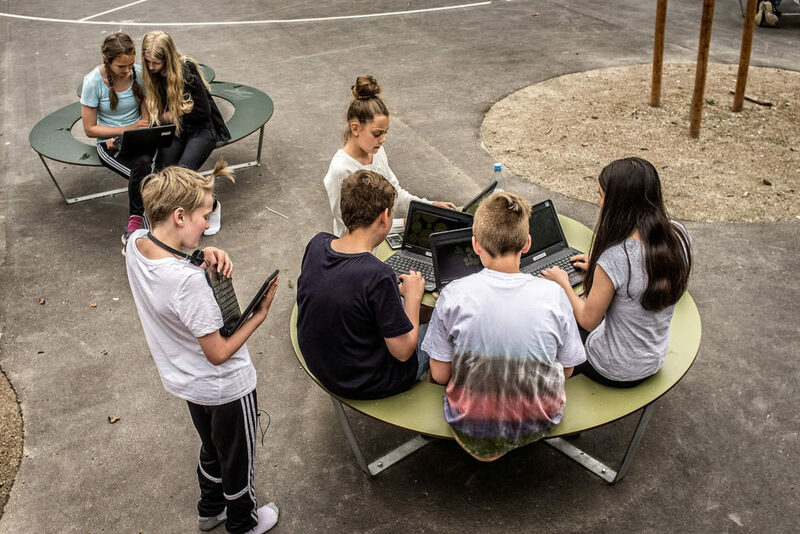 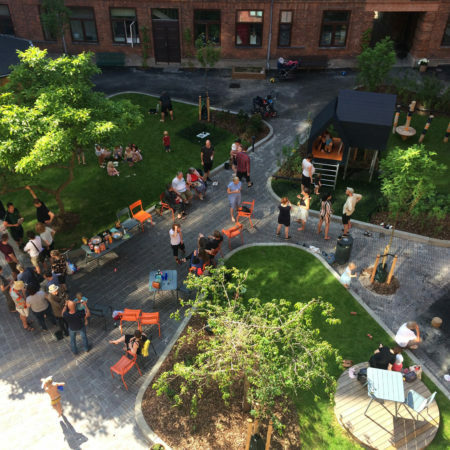 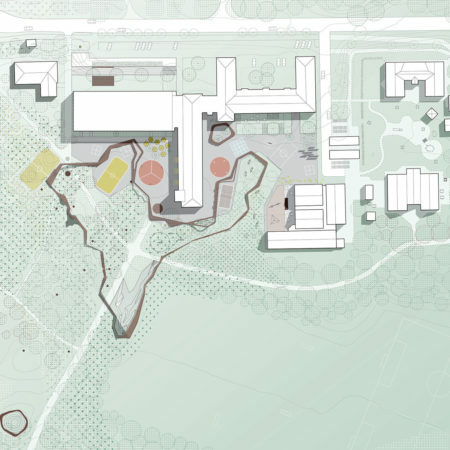 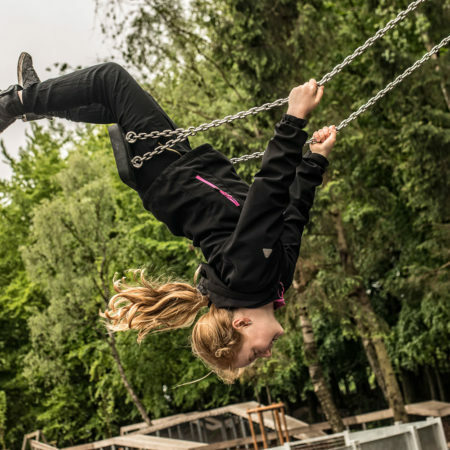 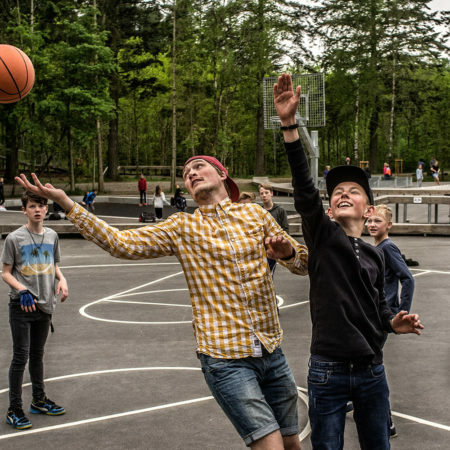 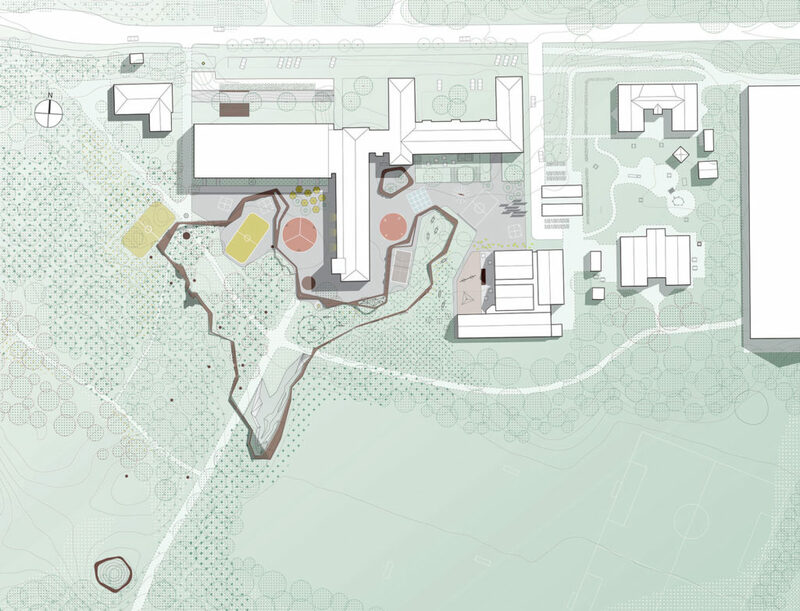 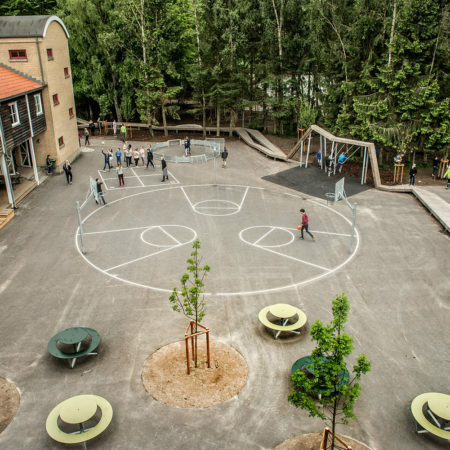 The project ‘Skørping School’ was selected for realization due to its focus on connections between school, forest and the local community, and for its special aim to activate both ‘couch potatoes’ and teenage girls. 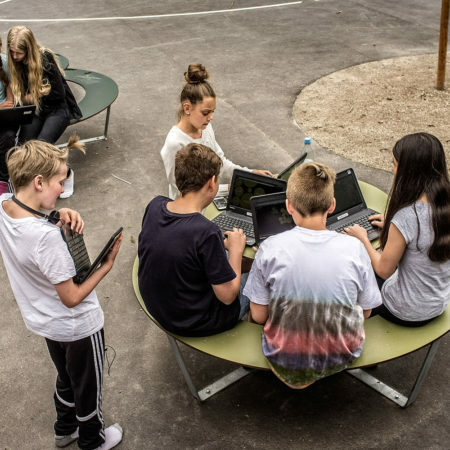 The project has included considerable work with a user participation process which involved the school staff, students and local stakeholders. 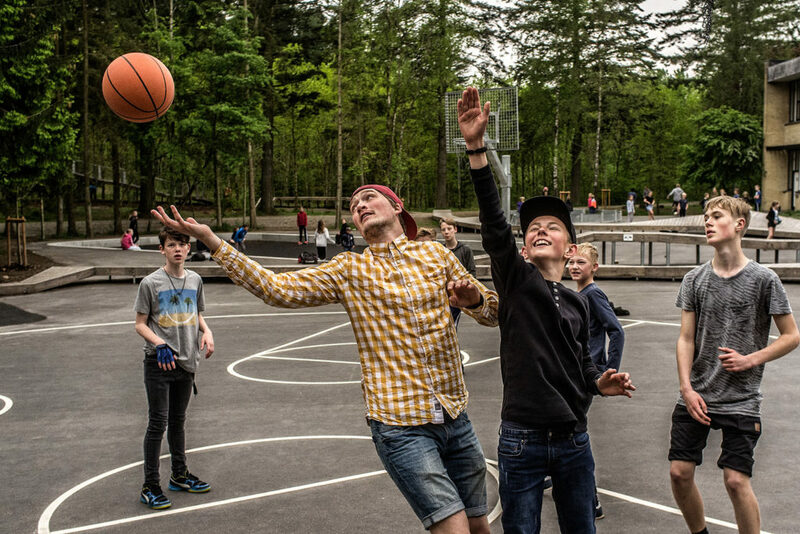 The goal has been to create a program which is built around the needs of the groups and based on a fundamental understanding of Skørpings special qualities and capabilities – all in order to exploit the resources of the locality, and ensure local participation. 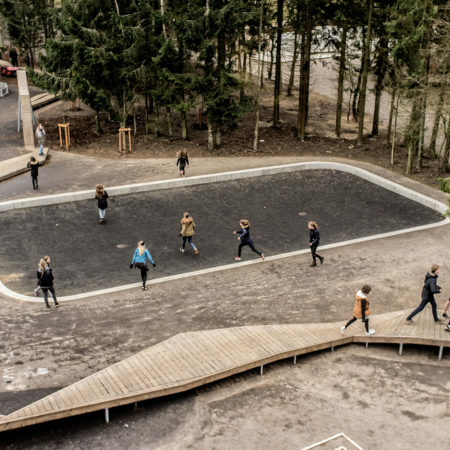 The vision of the project is to enhance the joy of movement with a new school yard which merges forest and school together. 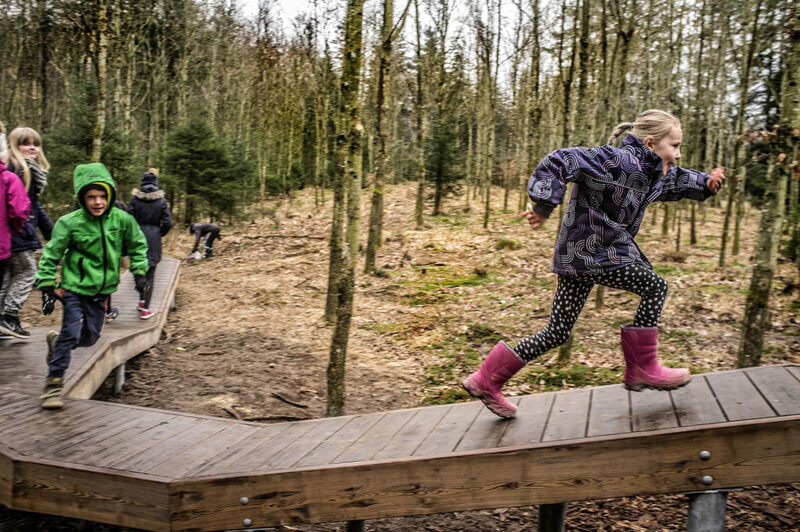 The forest should not only be a passive framework around the school, but should also become an active part of school life. 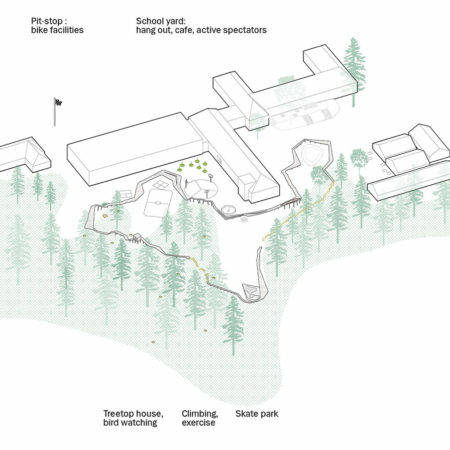 And in turn the school life must revitalize the forest. 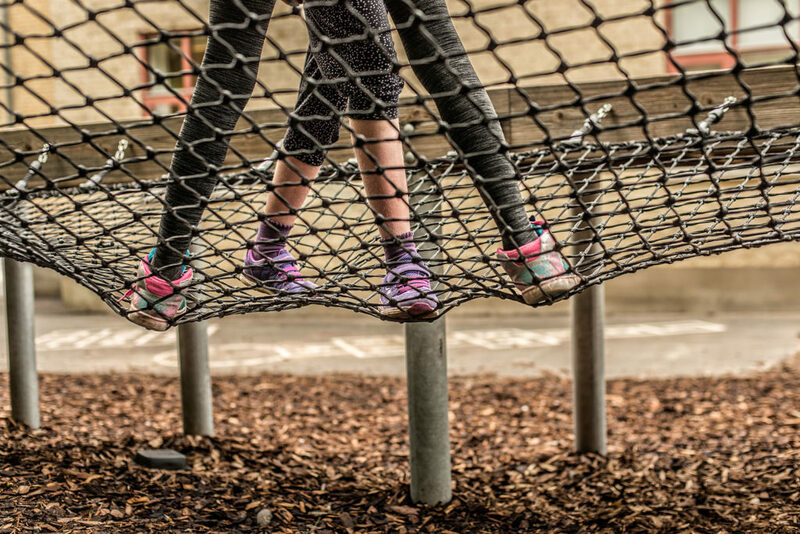 The project had a special focus on activating the most difficult group – the ‘couch potatoes’ – the socially challenged and mobile-dependent children. 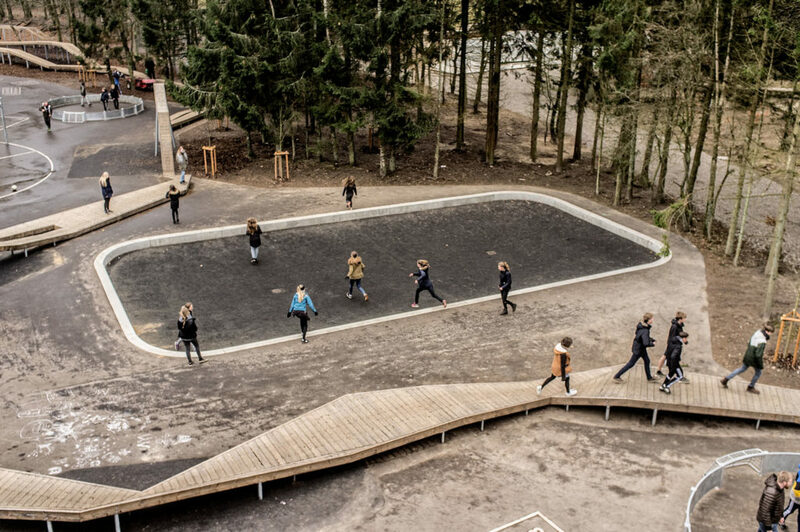 The method for this was to create ’including’ furniture, increase the number of ball fields and with a large social bench legitamize watching others play. 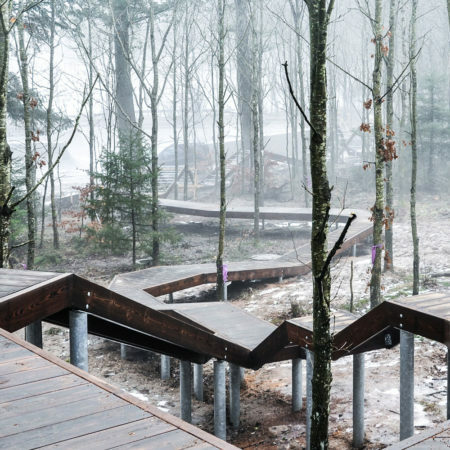 The project contains three elements; at the forest edge, where we have recreated ‘more of the good space’ by reinforing the edge of the space; cutting away and then adding new plants to extend the forest edge zone. 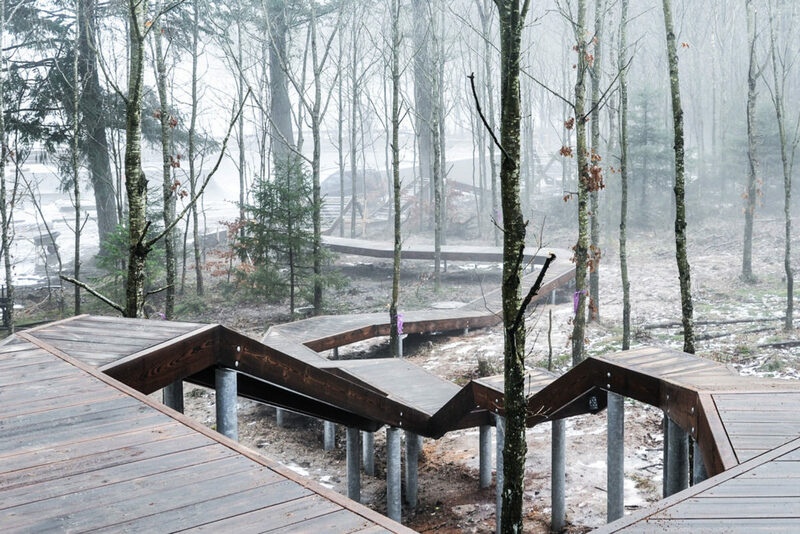 The second element is the continuing ‘forest loop’ of almost 500 meters. 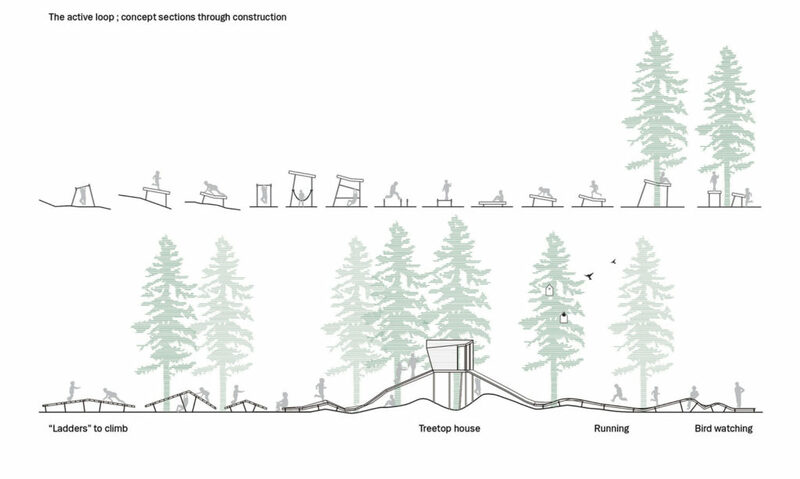 The loop is both a route and a spatial element. 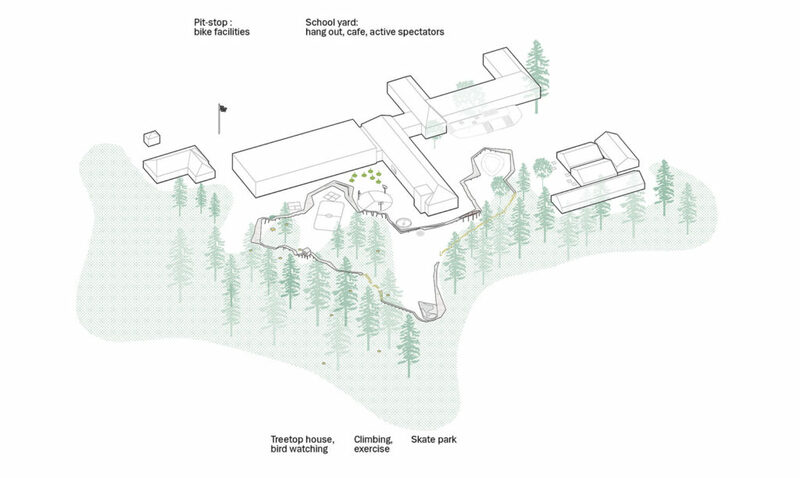 It takes students completely around the area – from inside the school yard and into the woods and back again. 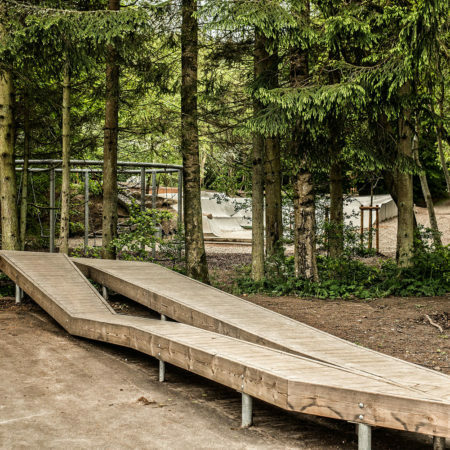 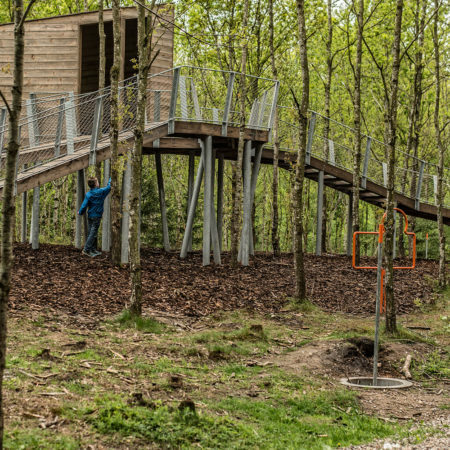 The entire route encompasses many different elements; grandstand, portal, balance beam, climb ladder, hanger benches and a treetop house. 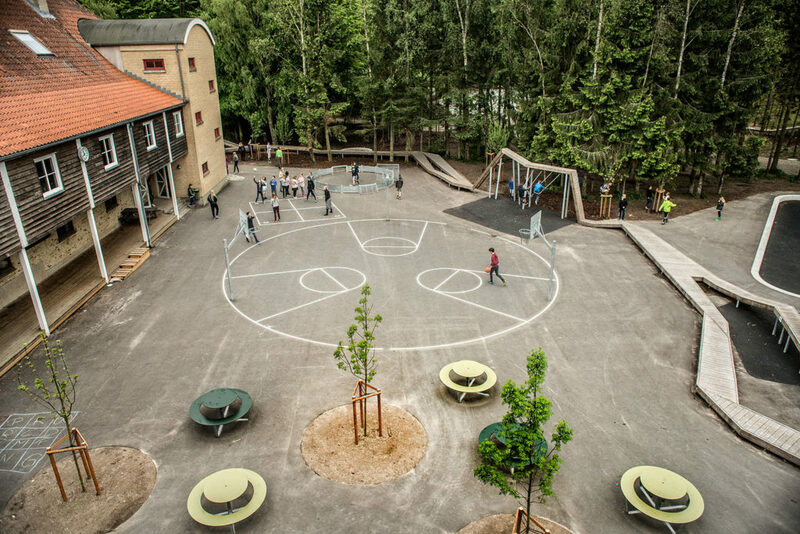 Play stations make up the third element of the project: playing fields, swings, skating and café tables. 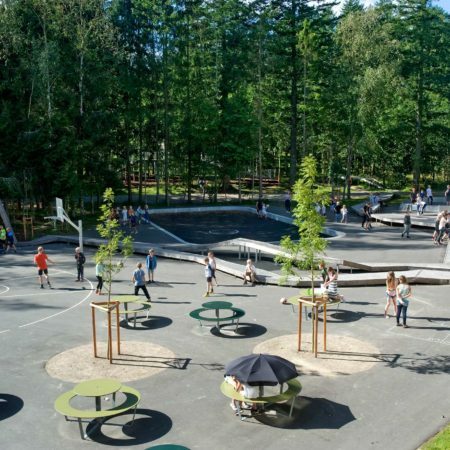 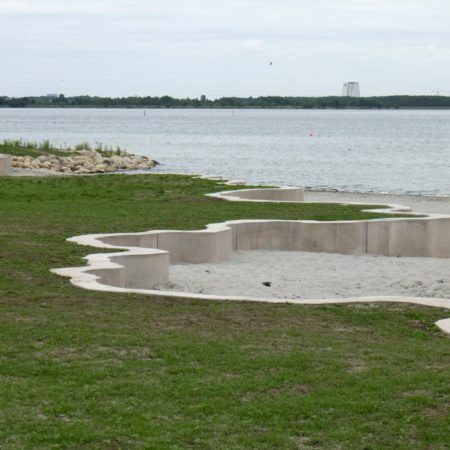 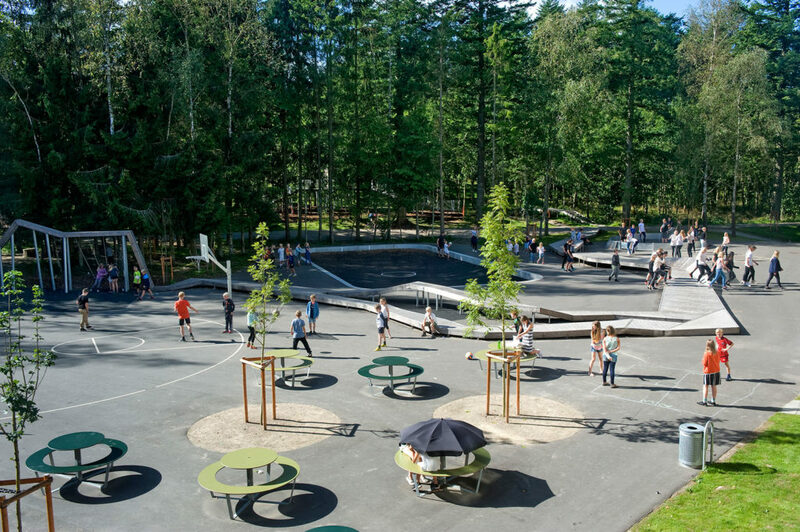 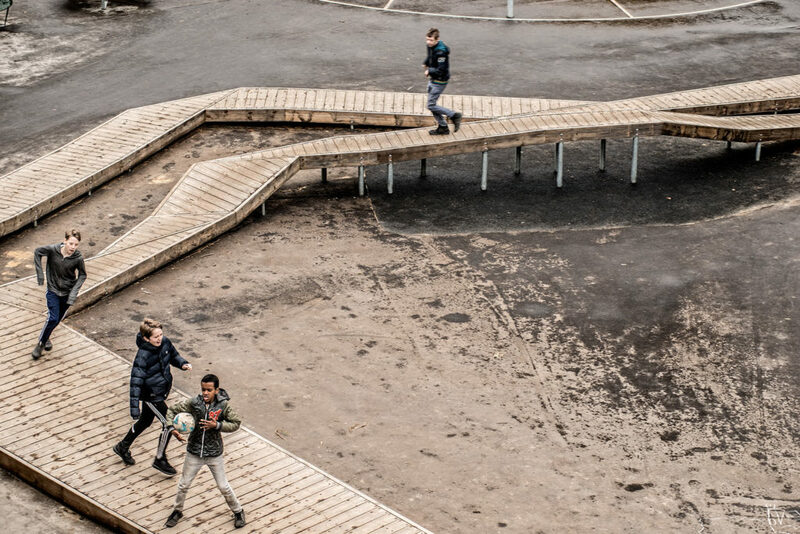 The big wooden loop invites everyone to come out and sit, walk, run or climb, and it connects the inner school yard with the neighbouring forest, ball fields and a new skate park. 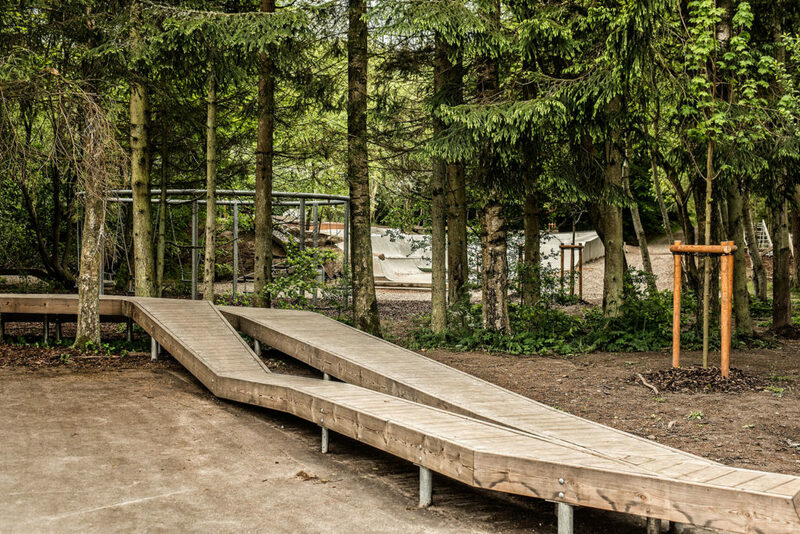 And more activities are related to the loop as well: an outdoor ‘lounge’, which can also be used for group work, a big screen and seating for outdoor teaching, and painted graphics, to be used as ‘game boards’ for both play and teaching. 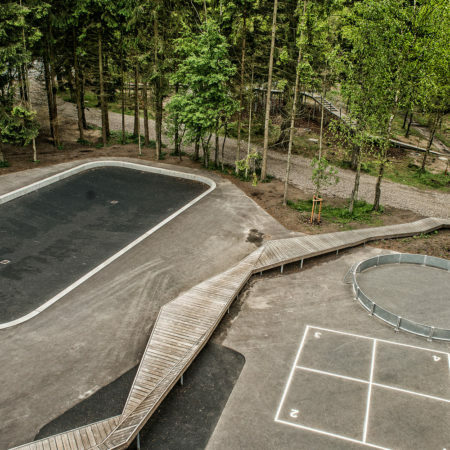 A sunken field with a softly curved floor and a circular basket field are both inviting the children to play well known ballgames in new and challenging ways, while the big ‘fishing’ net gathers all the teenage girls who are hanging out, jumping or watching the boys playing football. 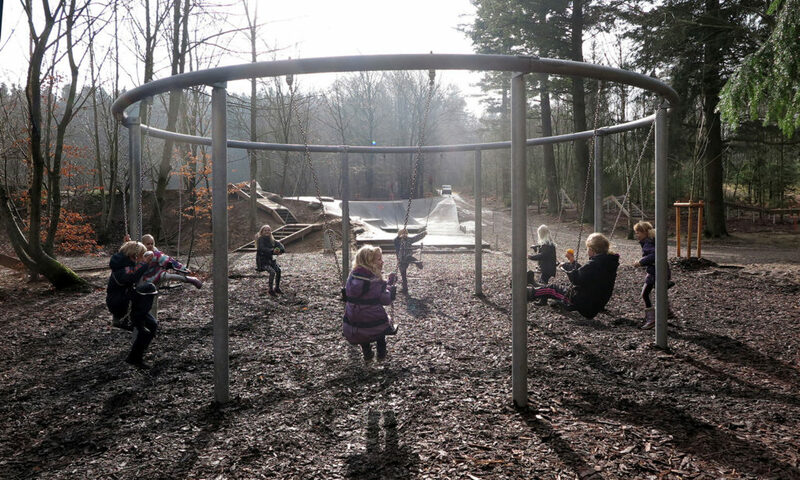 Further out in the forest, the girls are using the circular swing, ‘walking the loop’ as a 500 meter long catwalk or hiding in the secret treetop house. 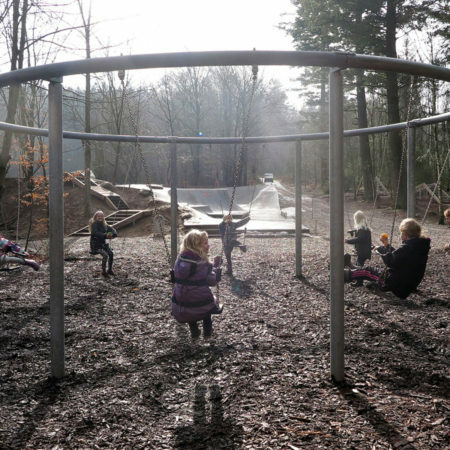 The neighbours and the rest of the community are also enjoying the new facilities. 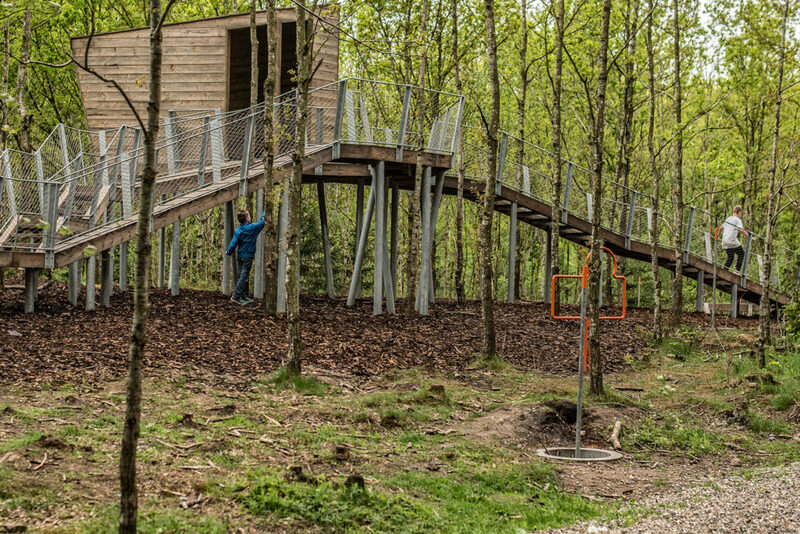 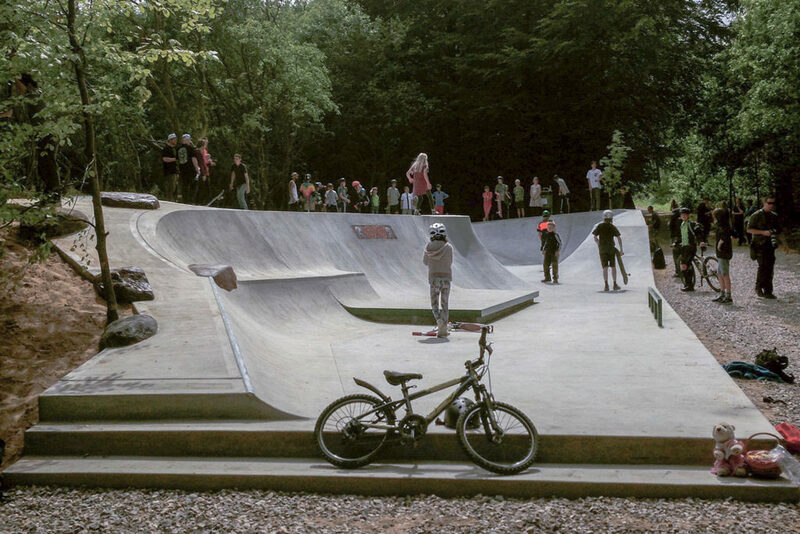 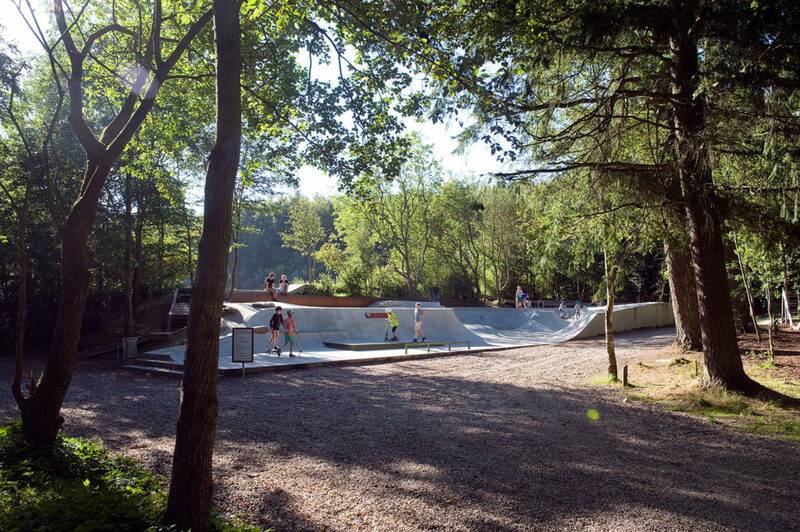 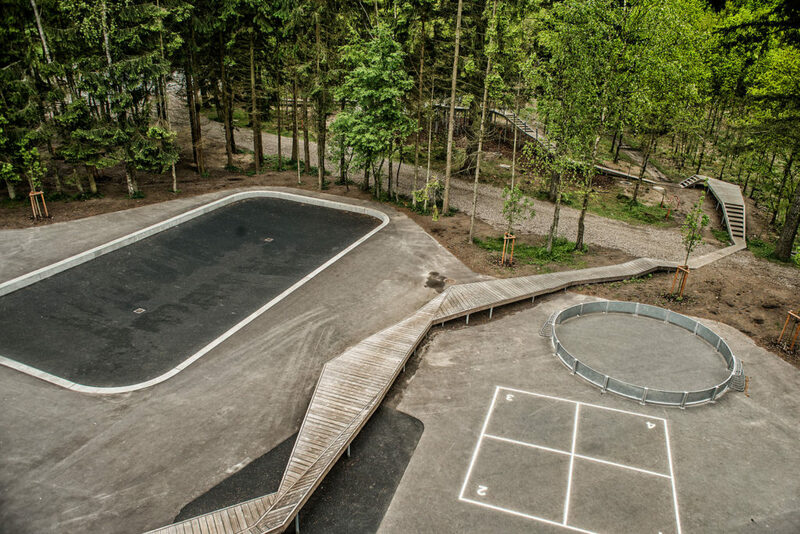 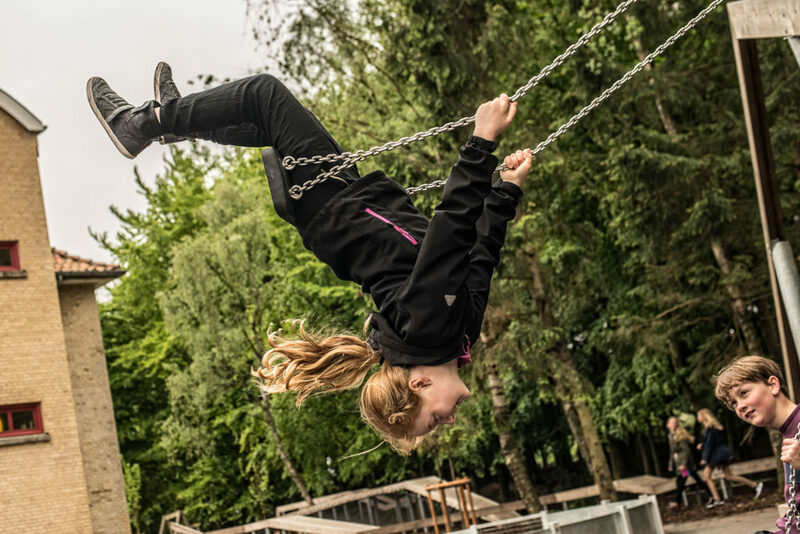 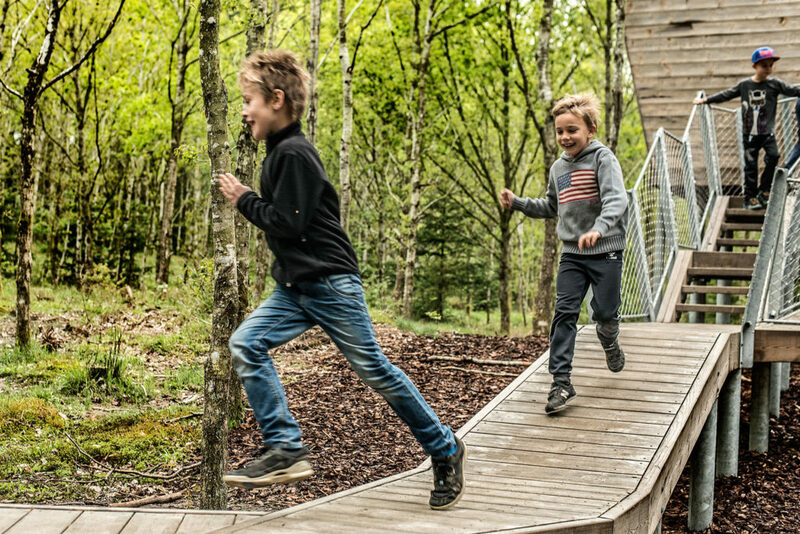 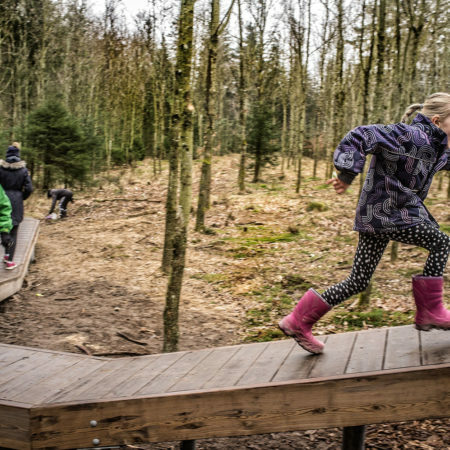 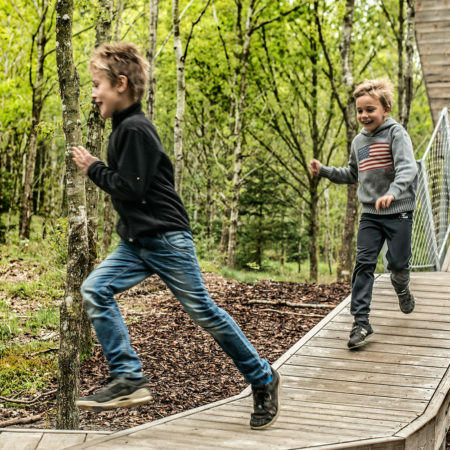 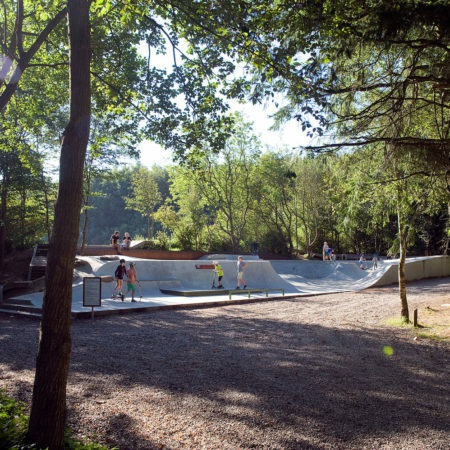 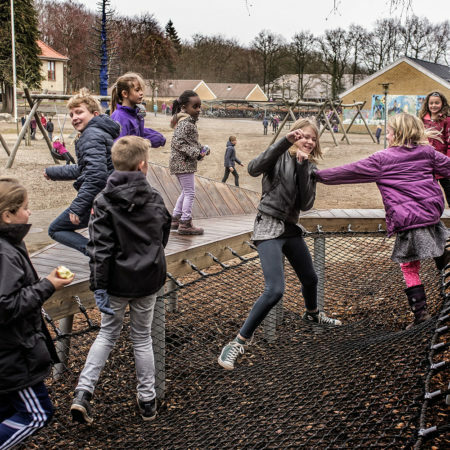 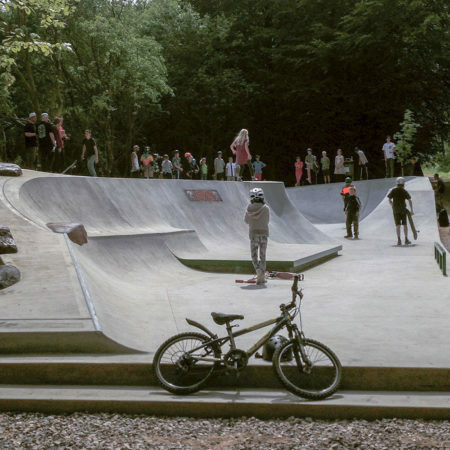 While the students of the school are invited out to play in the forest, the local community is also invited in to use the facilities of the school, and a new ‘loop of relations’ is growing.